President Donald Trump has voiced his support for the death penalty, and a recent Pew Research Center survey found an uptick in the share of Americans who favor capital punishment for those convicted of murder. 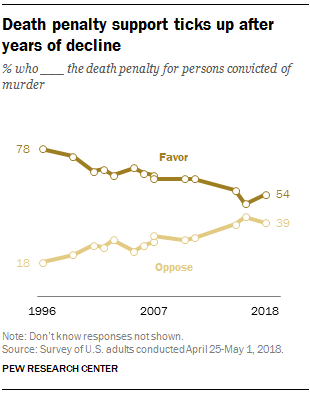 Over the long term, however, public support for the death penalty has declined significantly, as has the number of executions in the United States. 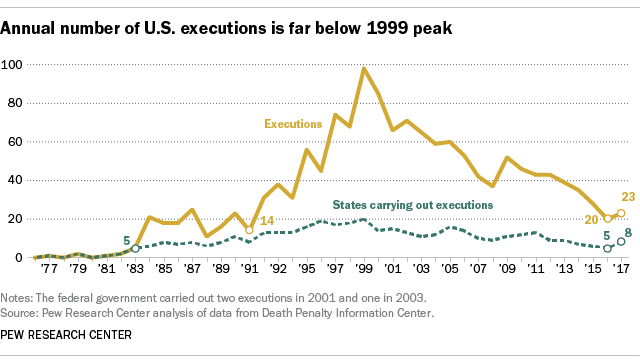 1 The annual number of U.S. executions peaked at 98 in 1999 and has fallen sharply in the years since. In 2017, 23 inmates were executed, according to the Death Penalty Information Center. That’s slightly higher than the year before, when 20 people were executed, but still well below the number of inmates annually put to death in the late 1990s and early 2000s. Just eight states – Alabama, Arkansas, Florida, Georgia, Missouri, Ohio, Texas and Virginia – accounted for all executions in 2017, compared with 20 states in 1999. 2 In 2017, for the second year in a row, the U.S. was not among the world’s top five countries in executions, according to Amnesty International, a human rights organization that opposes the practice. The U.S. ranked eighth internationally, behind China, Iran, Saudi Arabia, Iraq, Pakistan, Egypt and Somalia. Overall, there were at least 993 executions in 23 nations in 2017, down slightly from 1,032 in 2016. The international total includes only cases Amnesty was able to confirm – the report notes that some countries intentionally conceal death penalty proceedings. In the case of China, for example, the state may well carry out more executions than all other countries combined. Indeed, Cornell University Law School estimates that the Chinese government executed about 2,400 people in 2015, and has carried out thousands of additional executions in the years since. 3 Support for the death penalty in the U.S. has ticked up recently, but is far lower than it was two decades ago. 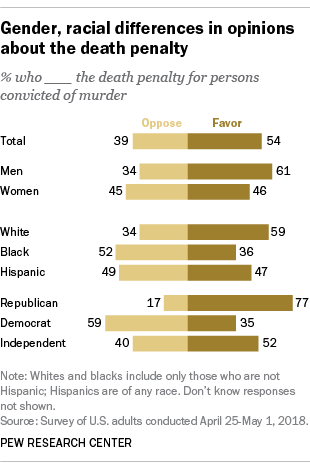 A Pew Research Center survey conducted in April and May 2018 found that 54% of Americans favor the death penalty for people convicted of murder, while 39% oppose it. That was up from 2016, when 49% of U.S. adults said they favored the death penalty, compared with 42% who opposed it. But it was far lower than in 1996, when 78% of Americans supported capital punishment for those convicted of murder. 4 There are racial, gender and political divides in opinions on the death penalty in the U.S. A majority of whites (59%) favor the death penalty, compared with 36% of blacks and 47% of Hispanics, according to the Center’s 2018 survey. Also, men are more likely than women to favor capital punishment (61% vs. 46%). Partisanship also plays a role, with Republicans more than twice as likely as Democrats to support the death penalty (77% vs. 35%). Americans harbor doubts about how the death penalty is applied and whether it deters serious crime. In a Pew Research Center survey conducted in 2015, about six-in-ten adults said the death penalty does not deter people from committing serious crimes. About half also said that minorities are more likely than whites to be sentenced to death for similar crimes, compared with 41% who said a death sentence is equally likely for both. About seven-in-ten adults (71%) said there is a risk that an innocent person will be put to death, including 84% of those who oppose the death penalty. Even a majority of death penalty supporters (63%) said there’s a risk of taking an innocent life. At the same time, a majority of Americans (63%) said the death penalty is morally justified when someone commits a crime like murder. Nine-in-ten death penalty supporters held this view. Note: This is an update to a post published May 28, 2015, written by Sara Kehaulani Goo, then a senior digital editor at Pew Research Center.